February 23,24,and 25th, you’ll find us in Portland at The Yard Garden & Patio Show. Nichols Garden Nursery is at booth 812. Stop by and see us, if you mention The Gardener’s Pantry blog, we’d like you to have a complimentary packet of sunflower or spinach seed, your choice. 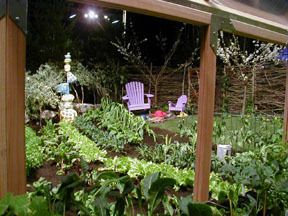 This show is at the beautiful Portland Convention Center and is the show where Oregon and Southern Washington gardeners come together once a year to shop, attend seminars and get a jump start on the gardening season. The beautifully designed display gardens at this show have theatrical lighting. A popular new feature is a wine garden and many attendees enjoy a stroll through the gardens with a class of wine in the evening. I’ll be speaking at 12:30 Friday on Containers & Small Space Edible Gardening and at 3:30 Sunday it’s Seed School 101 for those who want to learn how to grow a garden successfully and economically from a few packets of seeds. As you might imagine, February is a busy month for us. Gardeners are ordering seeds and ready to plant. I seem to be falling a bit behind on my blog but stay with me as that will change. It’s flower show time in the Northwest and Keane and I head up to Seattle Thursday, February 15th for two days of enjoying the ever wonderful Northwest Flower & Garden Show. I’ll never forget the first show I attended when Starbucks was only a coffee wagon in the hotel lobby. After buying my first tall latte’ ever I walked down Pike Street and into a wonderland of blooming trees, thatched cottages, an abundance of flowers, and even waterfalls. The sweet moist scent of spring was in the air and everything was right with my world. I’ve been back many times, as a garden designer, a sales exhibitor and as a speaker. This year I’m there to enjoy the show and attend a Garden Writers Association meeting. We so appreciate the effort so many put into this show and the price of a ticket brings hours of therapy to a gardener with winter doldrums. This years show runs February 14th thru 18th at the Washington Convention center. I designed this garden in 2004 for The GWA project “Plant A Row For The Hungry”. With the collaboration of NW garden writers and Pierce County Master Gardeners, we built this garden in four days. It was voted winner of “the peoples choice award” and also received a gold medal. We raised public awareness for PAR and the value of planting a little extra and contributing our garden surplus to local food banks or soup kitchens. I will write more about Plant a Row for the Hungry in the future. Watching bare twigs come into spring bloom brings a soothing joy into the house. I often pick quince branches on January 1 as a ritual of the New Year. However, if weather is cold, results are faster if I wait a few days for the sap to rise in response to warmer temperatures. A kitchen brush and a little liquid detergent washes away grime from the bottom third of the branches, the part that could add bacteria to the water vase. Next make a fresh slanting cut and place branches in warm water with flower preservative and change the water once or twice a week. Slowly the buds swell, color, and come into bloom and each stage is lovely. Arrange the branches when buds are tiny as they are easily knocked off just before blooming. If your arrangement is set in a well lit area, color, especially of pink or red flowers will be most intense. Forsythia, lilac, dogwood and prunings from fruit trees are all suitable for forcing. The link below gives an extensive listing of good plants for forcing and relative bloom time. A copy and paste is necessary and best to clear previous url first. Ah, just the first few signs of spring and I begin coaxing quince and forsythia branches into bloom. We have had a lovely sunny week here in Western Oregon, and while it is still cool that extra sunshine has begun turning fields and lawns into a soft green haze. Of course there are spots that will have you up to your ankles in mud but let’s not go there. My friend, garden writer, Joy Larkcom, writes from the UK, “It is all veggies over here now. About time!” We at Nichols Garden Nursery see signs of this here as well. It seemed to begin about the time of the great spinach scare when many realized they could grow their own spinach salads from a small packet of seeds. If you’re looking for a good early spinach, the variety “Jive” is fast growing and cold hardy. Harvest baby turnips when they are one to two inches in diameter. The greens are tender and delicious and should be cooked with the roots. Just wash and trim off the root tips, no need to peel. I cut off the leaves leaving about 1/2 inch of green stem. Trim turnips and cut each vertically into halves or quarters. Dice onion. Place a large lidded skillet on medium heat and add olive oil and then turnips and onion and gently sauté. Wash greens and cut into one inch lengths, including tender stems. When onions and turnips have cooked for five minutes add greens with water still clinging to the leaves, stir and cover with lid. Greens will cook down and become tender in five minutes. Serve with salt and pepper. Four slices of lean bacon can be used instead of olive oil and is quite delicious. Cut bacon into strips and cook until almost crisp, remove all but one tablespoon fat and add onions and turnips in the order above.